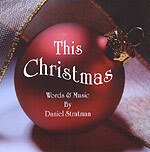 If it seems that every December brings the same roster of same-old songs, credit Vista's Daniel Stratman for doing his part to expand the number of songs available in the holiday repertoire. The singer and guitarist has written a bubbly little Christmas song that is now available as a single from his Web site (click on the "Buy it now" link to the right). In its upbeat tempo and mood, it's a light pop music treat somewhere between "Rockin' Round the Christmas Tree" and "Silver Bells." The rather sparse arrangement (guitar, keyboards, harmony vocals) brings out the song's strong melodic theme. All proceeds from sale of the CD go to benefit Stratman's 11-year-old son, who was diagnosed with type 1 diabetes this past summer.